The Minerva Mink character. Note the erased cleavage. Animaniacs is an animated series created by Tom Ruegger. It primarily features comedy skits centering around a large cast of characters, such as Yakko, Wakko, and Dot (or "The Warner Brothers and Sister"), two lab mice named Pinky and Brain, a grumpy squirrel named Slappy Squirrel, and various others. One character, Minerva Mink, only had two shorts released where she appeared: Meet Minerva and Moon Over Minerva. 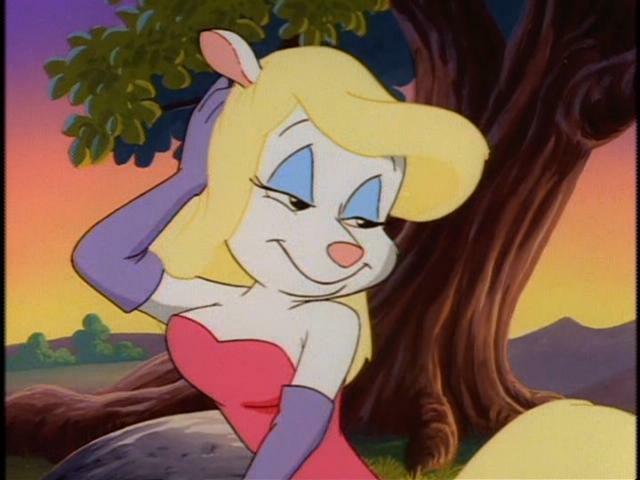 Because of the risqué nature of the character, there were rumors that there were other unaired animated shorts featuring her. The two shorts that centered around Minerva were edited in post-production by broadcasters such as Teletoon Retro, including altering her cleavage to be less pronounced. While airing Meet Minerva on their channel, the title card was different, but it was the same short as Moon Over Minerva. On April 18, 2016, Tom Ruegger participated in an "Ask Me Anything" topic on Reddit. One user asked about the existence of any unaired Minerva Mink shorts. Tom replied by simply saying that there were no unreleased shorts.